Megan grew up in Moose Jaw, Saskatchewan, and graduated from the University of Saskatchewan in 2016 with a BSc in Geological Sciences. During her undergraduate studies she worked with the Saskatchewan Geological Survey as a geological assistant and, along with fellow students, staked a mineral claim in Manitoba for orogenic gold based on an exploration project done in the Mineral Deposits course offered at the University of Saskatchewan. After graduation she worked for Apex Geoscience, where she gained experience in soil sampling, data analysis, and SWIR spectroscopy. She continued prospecting in Manitoba, which included staking additional claims, rock sampling, and conducting ground magnetic and VLF geophysical surveys. 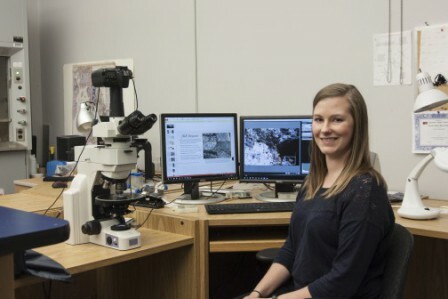 In September of 2017 she began her MSc under the supervision of Dan Marshall as part of the Petrology and Tectonics Research Group at Simon Fraser University. The IKE Cu-Mo-Ag porphyry deposit is located on the eastern edge of the Coast Plutonic Complex near Gold Bridge, British Columbia. Mineralization at IKE is Eocene in age and related to post-accretionary intrusions, which is in contrast to the well-studied Early Mesozoic porphyry deposits in British Columbia. Early halo type veins are concentrated in areas of high copper grade and are one of the first generations of veins in the system. The vein alteration halos are composed of sericite, biotite, chlorite, and potassium feldspar, similar to well-known porphyry deposits such as Butte, Montana and Ann Mason, Nevada. This study aims to define the link between early halo type veins and grade, find effective vectoring tools for deeper-set porphyry mineralization, and develop a conceptual deposit model for IKE. Mineral assemblages of alteration halos will be determined using petrographic studies, and vein alteration mapping will be done on drill core to determine the composition of vein selvages at higher grade. Shortwave infrared (SWIR) spectroscopy will characterise subtle changes in mineralogy throughout the system, and will be compared to assay results to see what minerals correspond best with high grade. Temperatures and pressures of the formation of quartz veins will be defined with fluid inclusion studies aided by cathodoluminescence (SEM-CL), which will help to constrain the paleodepth of the system. A deposit model will be integrating new data with data provided by Amarc Resources, and will provide an enhanced understanding and a new exploration model.